In nature, many materials excel in precision. They perform very precise tasks – and as researchers delve into their functions, they discover that complexity is at the bottom of this precision. Almost all natural materials are composites, intricate mixtures of pure compounds in order to arrive at the desired result. Nanocomposites are crude but effective ways to imitate this natural effect. This is the sixth article in a series on the forthcoming book by Alle Bruggink and Diederik van der Hoeven: More with Less, Welcome to the Precision Economy. The articles appeared on 30 October and 2 November 2016, and 24 January, 14 February, 18 March and 30 March 2017. Clay nanocomposite. Image: James Suter. Natural materials? Take wood: straight strings of cellulose in a loose matrix of hemicellulose strings, glued together by lignin. Oyster shells: alternating layers of chitin and silica. Eggshells: chalk with some proteins. Spider webs: mixtures of proteins. Cotton: cellulose with some proteins. Glass sponges (species living deep in the oceans): layers of silica with just the tiniest bit of proteins in between, structures so strong that engineers study them as an inspiration for the construction of bridges. Etcetera etcetera. Each composite material precisely tuned to the function it needs to fulfil, in an endless variation. Nanocomposites are composites, materials consisting of a matrix (a host material) and fillers that are added in small quantities but have a major impact on the material’s properties; like fibre-reinforced polyester that is much stronger than polyester by itself. But the special characteristic of nanocomposites is that the fillers are of the nano scale, i.e. in the order of a nanometre (nm), one millionth of a millimetre. Nano particles appear to have a much stronger influence on material properties than an equal percentage of larger fillers, say in the order of micrometres to millimetres. This is because a much larger percentage of the matrix material is in contact with the filler. Research suggests that fillers with a width smaller than 100 nm will significantly alter properties like electric conductivity, magnetism, strength and plasticity of the material. Major optical changes may occur when fillers are smaller than 50 nm. And materials may suddenly be much more catalytically active when fillers are smaller than 5 nm. Research into this field is expanding so rapidly that no researcher can cover it any more in its entirety, and many specialisms emerge. Fillers may be inorganic, like aluminium oxide and silicon oxide (sand), or organic like hard plastics or cellulose microfibres. 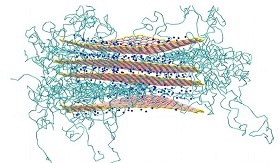 Among the most interesting fillers are carbon nanotubes, of which the potential applications were discovered in 1991. They are very thin, made of a roll of a single layer of carbon atoms. They can be made very long (several million times their width), or a bit wide which allows other molecules to be inserted, or double-walled etc. Carbon nanotubes can be added to metals, ceramics or polymers, markedly changing thermal conductivity, as well as electrical and mechanical properties. Equally promising is graphene as a filler. Graphene, isolated and characterized as recently as 2004, consists of a very thin sheet made up of single carbon atoms. Because graphene reinforces its host material in two directions instead of just one, as in the case of carbon nanotubes, its influence on the material’s properties may even be more marked. Abalone shell. The majority of the shell is composed of layers of overlapping platelets of calcium carbonate crystals, or aragonite, (grey). Between the layers are thin sheets of protein (not seen). Photo: Science Photo Library. As we learn more about nanocomposites, researchers discover that nature makes extensive use of them as well. This should not surprise us, for the nano scale is the scale of large molecules like proteins. Abalone shells are a well-known example. The main constituent of the shell is calcium carbonate (chalk), the same material of which egg shells are predominantly made of; a material very brittle by itself. But abalone shells are very resistant to shocks, much more so than egg shells that need to be broken from the inside by the chick. 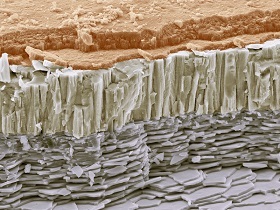 In the abalone shell, microscopic calcium carbonate tiles are stacked like bricks. The tiles are held together by very sticky protein molecules. When the abalone shell is struck, the tiles do not shatter but slide; the protein stretches and in so doing absorbs the energy of the blow. In ceramics (like the abalone shell), nanofillers are particularly useful in their contribution to the toughness of the material. Ceramics are widely used because they hardly wear and are very stable. However, they are brittle, and this often stands in the way of their wider application. Many ceramic nanocomposites are much more resistant to fractures than the original material. In metals, nanofillers often remarkably reduce the ductility of the material. Metals are widely used in industries like automotive and aerospace. They are tough, but weaker than ceramics. Metal nanocomposites often exhibit features that combine the two areas: the toughness of the metal together with the strength of ceramics. But in polymers, nanofillers may have the most remarkable effects. They may improve the material’s resistance to heat and shocks, its flame retardation property and mechanical strength, and decrease its permeability to gases and water vapour. And they may lend new magnetic, electronic, optical or catalytic properties to the material, while retaining the unique properties for which polymers are much valued, such as their processibility and the ease with which we can draw them into films. So with the appropriate nanofilling, we can end up with lightweight and ductile materials with unique, e.g. magnetic properties. And in an area that is bound to become more important, the appropriate nanofiller may turn the polymer much more biodegradable. In sum, nanocomposites add considerably to the range of materials to mankind’s disposition. With nanofillers, many materials may get new useful properties precisely tuned to the desired application. However, recycling of nanocomposites, bound to become increasingly important, has hardly been studied so far. And there may be health effects. Nanoparticles once released from their host material, may harm human health and the environment. From the very beginning of nanocomposite research, scientists have been aware of this. By the 1990s, ‘better safe than sorry’ was the prevailing mood among researchers, in view of powerful public opposition to technologies once thought be beneficial, like nuclear energy. But so far, twenty years of research into this area has not led to any firm conclusions about adverse health effects. In some cases, particles of the nano size have even been proposed as vehicles for drug delivery in the human body, like Ben Feringa’s molecular submarines. Yes, biochemical effects have been shown; for instance, some nanoparticles can cross cell walls. But so far, adverse health effects have not been established with any certainty. We need to be cautious, but there is no indication that application of nanoparticles will endanger human health or the environment.